Creating a more sustainable Princeton requires all hands on deck; hands in the dirt mixing compost into the soil or on a keyboard writing code. Sustainable Princeton is partnering with Code for Princeton's first civic hackathon on Saturday, June 6th noon to midnight & Sunday, June 7th 8 am to noon at the Princeton Public Library. The event will bring together civic hackers, local government, developers, designers, makers, community organizers and anyone with the passion to make their city better. Anyone can participate; you don’t have to be an expert in technology, you just have to care about your neighborhood and community. Registration is required at http://codeforprinceton.org. On Sunday, May 31st, a week prior to the event, there will be a Community Outreach Forum with Mayor Lempert to brainstorm on how technology can improve the city. Bring your ideas on how technology and open data can make Princeton more sustainable. What is the Code for Princeton civic hackathon? A civic hackathon focuses on building new apps and technology solutions using open public data for social good. Anyone in Princeton that wants to collaborate with technologists and community partners to solve problems using open data and creativity are welcome. Use the Should I go to a civic hackathon? 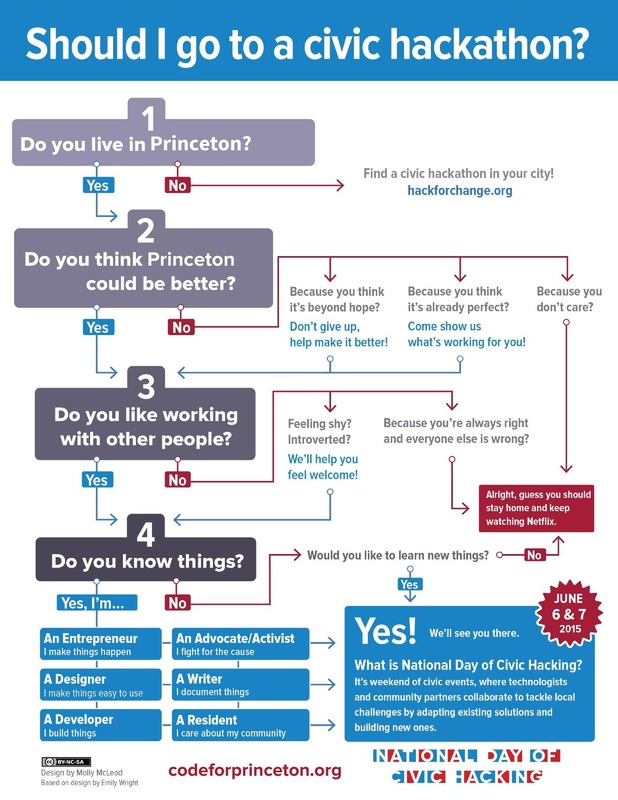 decision flow-chart to determine if you should get involved. Spoiler Alert: the answer is "Yes!" Isn't "hacking" a bad thing? Not necessarily. The term "hacking" or "hacked" is sometimes used to describe the illegal activity of breaking into computers and computer networks. It can also mean the activity of exploring the limits of what is possible with programmable systems, creating software and sharing it with others. Civic hackathons are events that bring together web designers and developers, activists, writers, local government, non-profits and community members to address local issues in a collaborative manner. How can Code for Princeton help make Princeton more sustainable? Are there sources of public data that can be used to measure and communicate sustainability metrics? The answer is "yes". The Environmental Protection Agency (EPA), the National Renewable Energy Laboratory (NREL) and other agencies provide open data sets. Sustainable Princeton also has aggregate energy usage data open to the civic hacker community that can be used to create tools to measure and communicate Princeton's energy consumption and greenhouse gas emissions. Code for Princeton provides the forum to use such open data to create and implement new ideas to make our community more sustainable. Checkout some of the projects from the international Green Hackathon for other sustainability projects for inspiration. What if I can't make it to the Code for Princeton civic hackathon? Don't worry. Code for Princeton is an official Code for America Brigade and will continue to meet after the hackathon to work on projects. Join the Code for Princeton Meetup group to stay up to date on future events. And stay tuned for a second hackathon later this fall.